By the 1880s, London had already played host to high-profile political exiles from the Russian Empire for a number of decades, most famously becoming home to Alexander Herzen, who set up the Free Russian Press in Bloomsbury in the 1850s, Mikhail Bakunin, who joined Herzen in 1861 after escaping from Siberian exile, and Peter Lavrov, who published the revolutionary journal Vpered! (Forward) from a North London suburb from 1873 to 1876. The arrivals continued in the 1880s, with the anarchist Peter Kropotkin and members of the revolutionary organization The People’s Will such as Sergei Stepniak-Kravchinsky and Feliks Volkhovsky settling in London. But by now such radicals were no longer isolated voices, as this was also the period of working class, mainly Jewish immigration from the Russian empire, as people escaped the appalling conditions and restrictions of life in the Pale of Settlement. According to William Fishman’s East End Jewish Radicals, roughly 30,000 immigrants arrived in London between 1881 and 1891. There was a connection between the influx of refugees and the exiles from the revolutionary movement. The assassination of Tsar Alexander II in 1881 led to the crack-down on the revolutionary populist groups that saw many radicals imprisoned or sent into exile in Siberia. It also provided the excuse for pogroms and the escalation of the official policy of anti-Semitism in the Russian empire: the Jews were blamed for the murder of the Tsar in many quarters, and thereafter it continued to be convenient for the Russian government to conflate Jews and revolutionaries. Similar assumptions were common in Britain; the Russian monarchy may have been unpopular, but that did not mean there was any rush to embrace its opponents or victims, particularly if they were Jewish. The arrival of Eastern European refugees in large numbers was not the first incidence of mass immigration into Britain, but it was perhaps the first of the media age, and popular opinion decried the threat to the British way of life and British jobs posed by the new arrivals. There was significant socialist and anarchist activity among immigrants from Eastern Europe, reflecting the growth of labour and working class movements at the time. Moreover, new arrivals, whatever their profession or status at home, usually found themselves destitute and had to turn to sweatshop work to survive. According to the anarcho-syndicalist journalist Rudolf Rocker’s memoir The London Years, ‘badly paid and half-starved’ and living around Whitechapel, an ‘unsavoury part of London’ that had once been a ‘notorious criminal quarter’, the newcomers provided a ready audience for the Russian activists and propagandists who spoke the same language. These activities involved a good deal of agitation and protest, but they were a considerable distance from the bomb-throwing outrages of popular imagination, and were far more concerned with education and welfare. But the largely mundane reality never made a very good story, so it was perhaps to be expected that the most tenuous links to more sensational events were milked to the extent that they created the presumption of a connection between Russians and Jews, anarchism and violent criminal activity, focused specifically on this part of London. Whether they expressed a genuine fear of ‘aliens’ or they were an attempt to manufacture such a fear, they became a firm part of popular East End lore that persists to this day. The Jack the Ripper case has always been notorious for the number of conspiracy theories it has generated, and it was here that bones of the Russian/Jewish/anarchist/government plot began to emerge. the crowds who assembled in the streets began to assume a very threatening attitude towards the Hebrew population of the District. It repeatedly asserted that no Englishman could have have perpetrated such a horrible crime as that of Hanbury Street, and that it must have been done by a JEW – and forthwith the crowds began to threaten and abuse such of the unfortunate Hebrews as they found in the streets. The anarchist angle was also quickly established, when the body of the third victim, Elizabeth Stride, was found on 30 September 1888 in the yard of 40 Berner Street (subsequently renamed Henriques Street), the premises of the International Workingman’s Educational Association. Founded in 1884 by the Society of Jewish Socialists, this was a well known meeting place for radicals and featured as such in Ripper Street. Russian-language activity was prominent, including, according to Fishman, amateur performances of plays by Stepniak-Kravchinsky and Volkhovsky, as well as educational and propagandist activities. Almost immediately, Russian/anarchist theories began to emerge. In the weeks after the Berner Street murder, stories surfaced concerning one Nikolai Vasiliev, who was described as both a ‘fanatical anarchist’ and a leader of the skoptsy (the castrates religious sect) – an improbable combination that looks like an attempt to fit in as many exotic and titilating details as possible. The Jack the Ripper Casebook does a good job of unpicking the story; it seems unlikely that Vasiliev ever existed, and the involvement of the notorious right-wing Russian commentator Olga Novikova in disseminating information about him gives credence to the suggestion that the story was an attempt by the tsarist secret police, the Okhrana, to discredit the revolutionary movement in London. The other prominent Russian theory, naming a Russian doctor called Alexander Pedachenko as the culprit, came to light later, and is also significant because of its apparent pedigree. Supposedly a manuscript left by Grigory Rasputin (himself the subject of considerable conspiratorial myth) claimed that he discovered ‘the truth’ through an Okhrana spy named Niderost, who was told the story by an old Russian anarchist called Nikolai Zverev. For good measure, the conversation between these two said to have occurred at the Jubilee Street anarchist club in Whitechapel; see the Jack the Ripper Casebook. The Gender Variance Who’s Who includes some further details that place Pedachenko in the service of the Okhrana himself, but goes on to make short work of the story as a whole. Nevertheless, in working in both an anarchist plot and a Russian government conspiracy, it shows what became the necessary components of the myth. It was no surprise to see both sides of this master plot working out in the Ripper Street episode. 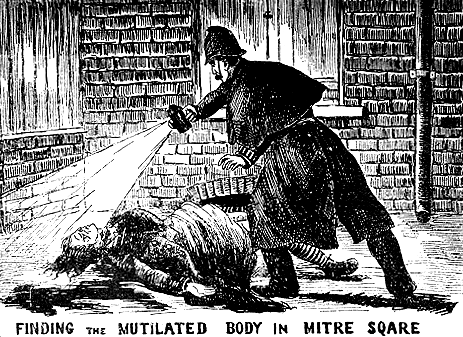 The assumption that the Ripper’s crimes must have been perpetrated by a Jew or a foreigner, and the subsequent characterization of violent criminal activity in the East End (in particular relating to the Sidney Street Siege of 1911) as political when it involved Russians and Jews, dramatized the position of immigrants from Eastern Europe as other. Fuelled by sensational stories about nihilists in the news, and books about revolutionaries, such as Stepniak-Kravchinsky’s Underground Russia, and their fate in Siberia, the image of Russians as daring conspirators gained currency long before the revolution. Meanwhile the tsarist agents’ tendency to provocation meant that they too were seen as subversive; stories of Okhrana involvement in crime seem almost as common as those concerning anarchists, so that the state and its opponents are strangely identified with each other in the popular perception. In between them, of course, and suffering the consequences way beyond the confines of the Russian empire they were trying to escape, lay the mass of ordinary immigrants. A longer version of this post was originally published on Sarah J. Young’s blog. Sarah J. Young is Lecturer in Russian at SSEES. Her main areas of research are nineteenth- and twentieth-century Russian literature, thought and culture.